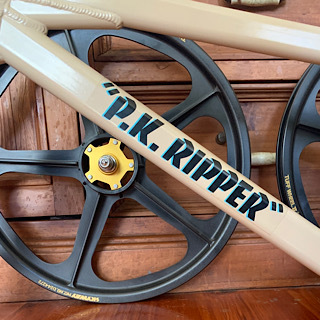 The frame has been powder coated blue. All other black parts have been powder coated except the handle bars. Wheels and tires are powder coated matte black vintage Lester Mags with Motocross duro tires. Seat is NOS Huffy and sissy bar is original to the bike. Stem is Wald. Custom vinyl cut decals created an added by us at LMC. Bottom bracket is Shimano with aluminum cranks and old school style trap pedals. Bmx style chain wheel. Chain guard is original but refinished with original style graphics with custom number added. Number plate is made by Mair USA with custom vinyl number "78"
Sold this bike on eBay to the UK but was seized by 3rd party shipper Pitney Bowes and deemed to large to ship and was liquidated. If you have this bike you are a lucky guy/gal. A bicycle is like a toothbrush; you should have one and use it often. I had one of these at 11 years old. I learned to ride one like this. Thank you for tripping that memory. It was great time for me except for the fire plug. LOL! "The Best That Never Was." Pro MemberK.O.B. "King Of Bling"
That's a cool little ride. I would be bummed if I was the guy who bought it and lost it because of some kind of BS.